The BetAmerica Welcome Bonus is an offer available only for new customers who have not made a first deposit. Existing customers will not be able to activate the bonus. Customers must open a BetAmerica account and use the BetAmerica Promo Code during the sign-up process. All new customers are only entitled to one first deposit bonus. All following deposits are not affected by the bonus conditions. Bonus money is available in the pending bonus balance. The pending bonus balance is released into Cash Balance at the rate of 10% of the value of each bet placed, or every paid contest entered in BetAmerica Sports and Games. If the full pending bonus balance is not released within 30 days of the initial first deposit, then the pending bonus balance left over will be forfeited. Refunded bets do not count towards the unlocking the pending bonus balance. Visit the BetAmerica website and click the Sign-Up button found on the top right-hand side of the main page. A registration form will pop-up in your browser. Enter your Full Name, E-mail Address, and Date of Birth. Click Submit’ after you have finished. You will now be transported to a longer registration form which needs additional information such as your Mailing Address, Gender, and Phone Number. You also must create a unique Username and Password which will be used to login to your betting account. Notice a field named ‘Promo Code’. This field is not necessary to be completed as no BetAmerica Promo Code is required to activate the Welcome Bonus. Lastly, you must disclose the last 4 digits of your SSN. After you have successfully completed all of the above, click the ‘Submit’ button to complete the registration process. Now that you have a BetAmerica account, you are able to make a deposit. Remember that the amount of your first deposit will be matched with a bonus up to $100. Pick a deposit method of your choice and provide the necessary details to complete the transaction. The bonus money will immediately be released into your account and be available as your pending bonus balance. You can move it into your real money balance in 10% blocks by completing the wagering requirements. If you run into any issues that cannot be answered by the above guide, please contact the BetAmerica Customer Support Team via Live Chat to address any problems you may be having. BetAmerica is accessible via a browser-based platform which is compatible with both PC and mobile. The mobile browser-based platform has the same functionalities as the computer-based platform but has been optimized to provide maximum efficiency to mobile devices. To access the browser-based platform on your mobile device simply type in the BetAmerica web address into your browser. 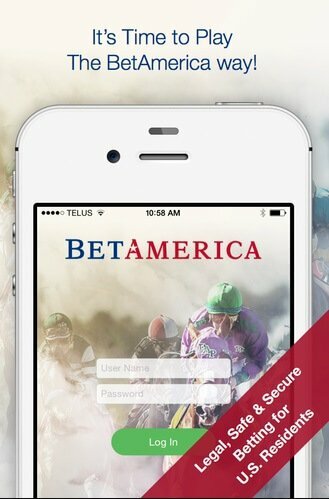 A BetAmerica mobile app is also available. You can download it from iTunes or Google Play for Apple and Android devices, respectively. 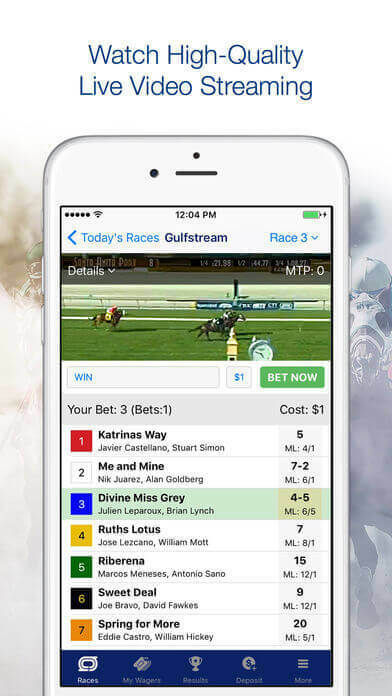 The app has live video streaming capabilities and you can catch every horse and greyhound race. Plus, there are quick deposits using PayNearMe, eCash (ACH), Visa, or Mastercard. The mobile app is ideal for users who are looking to place bets on the go and monitor their bets closely. 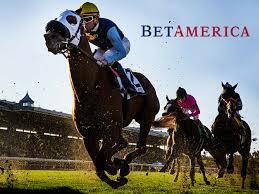 The BetAmerica site was created with easy navigation in mind. From the main page, you can click on the main menu which opens access to all bets, promos, results, and a calendar of all racing events. The BetAmerica horse racing page presents a daily schedule of races and gives you access to results and replays of past races. A Track List and Live Video Streaming of upcoming races can also be found through the BetAmerica horse racing main menu. Betting information for the next scheduled race is shown down the middle of the main page. Here, you can place a quick bet.For information on the VIP services and Reward Program, you can click on the ‘EXTRA’ button found on the BetAmerica Horse Racing Mainpage. Daily podcasts and the latest promos are also found in the EXTRA section. Placing a bet is very simple at BetAmerica. All you need to do is find a race that you want to bet on and click on the name of the horse or horses your bet will feature. The odds of your bet and possible payouts are immediately displayed on the betting slip found on the right-hand side of the page. After you have selected the horses for your bet, click on ‘Place All Bets’ to finish the betting process. You are able to view past bets in the betting history section. BetAmerica Horse Racing features over 200 horse racing tracks from around the world including Canada, Australia, Ireland, and the United Kingdom. However, US domestic tracks get special attention. The wagering process works exactly the same as if you were actually on a track, with all bets you place being pooled with wagers placed by the people on the ground at the track. You get paid full track odds on all winning wagers. Major horse racing events such as the Kentucky Derby, Preakness Stakes, Belmont Stakes, and Breeders Cup, in particular, are very well represented. You can find bets available months in advance of the actual races. Another key aspect of betting at BetAmerica Horse Racing is the variety of resources available to bettors. You can look through scouting reports, past races, and horse racing results, as well as podcasts and other handicapping resources. Considering all of the data you at your disposal to place educated wagers, your likelihood is high that you’ll make more winning bets. You are able to your bets up to one minute before the start of a race, so you can modify your bets as weather and track conditions change. Select to Win – with Select to Win bets, you simply call the winning horse of the race. This is the most common type of horse racing bet. The payoff for Select to win is in the medium range with odds higher than Place and Show bets. Show – Show bets require that you pick a horse that places top 3 in the race. Due to the fact that the odds of picking a horse finishing in first, second, or third are more likely than selecting the winner, the odds for Show bets will be on the lower side. Place – for Place bets, you need your horse to finish in either 1st or 2nd place for you to win. The odds are higher than a Show bet but lower than a Select To Win bet. Exacta – Exacta bets require you to choose the 1st and 2nd place finishers of a race in the exact order that they finish. If you pick the two winning horses but in an incorrect order, the bet still loses. Exacta bets have much higher odds than Select to Win and Show bets because they require two accurate selections. Superfecta – with the Superfecta bet, you must pick the top four horses of a race, however, your hoses are not be required to finish in a specific order. The odds may vary based on the horse race. Daily Double – Daily Doubles give you the chance to choose the winner of two consecutive races. This is similar to picking two Select To Win bets with the added clause that if you choose either race incorrectly, your bet loses. BetAmerica has long been one of the leaders in Greyhound racing, providing access to over a thousand live races per week. The site features over 20 tracks from all over the US, including all the major competitions and races, but also smaller races on a daily basis.Much like horse racing, the Greyhound racing betting process is exactly the same as if you were at the track. Your money is pooled with track goers and the payouts are the same as if you were actually watching the race live. The types of bets for Greyhound racing are similar to horse races with win, place, show, as well as the exotics, keys, and wheel bets all available to users. The option to play fantasy sports is a relatively new addition to the BetAmerica site. You can play daily fantasy sports in Football, Baseball, and Basketball. The site provides minute-to-minute coverage and displays how well your players and teams are doing when you play draft games.In Daily Fantasy Sports you are not competing against the site. Rather, you play against other players on the site. Since BetAmerica has no stake in who wins or loses, this means an even playing ground for everyone. All players get access to the same information and tips. A new handicapping contest lets bettors use their handicapping knowledge of horses to make money. The game is designed for all levels of horse and greyhound racing fans and is available in a wide range of contests, from head to head to large tournaments. With BetAmerica you can also place bets on a great range of sports and games. The BetAmerica Sportsbook can, for now, only be accessed online by players betting from New Jersey, but more states are likely to follow. Pennsylvania is launching a retail sportsbook to be expected to open in 2019, with an accompanying mobile and online Sportsbook to come at a later date. Welcome Bonus: 100% first deposit bonus for all new users worth up to $100! There is live video from over 325 race tracks across the globe and over 4000 live races to watch and wager on every week. Every verified customer gets ten hours of free live video every month and is given additional hours depending on how much wagering they do on the site. Live video of races can be watched at any time by clicking on the live video button on the BetAmerica Horse Racing main page. Same page betting options go along with the live stream to ensure you don’t have to waste any time between watching your race and placing your bets. Live streaming is available for both computer and mobile devices. BetAmerica is loaded with helpful betting tips and many valuable betting resources. A BetAmerica account grants free access to a large handicapping guide and even Pro picks. Since BetAmerica works on commision and their bottom-line isn’t affected by whether a bettor wins or loses, they tend to have more accurate information than other betting sites that have something to lose by sharing key information. Take advantage of the great resources and expert advice, it can easily be the difference between a winning and losing bet. Alternatively, you may want to try using the detailed FAQ section before contacting the support team for answers to common problems.